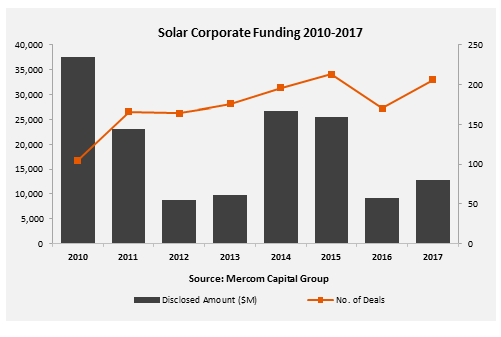 Total global corporate funding into the solar sector, including venture capital/private equity (VC), debt financing, and public market financing raised came to $12.8 billion, a 41 percent increase compared to the $9.1 billion raised in 2016. "A strong fourth quarter pushed overall funding higher in 2017. Higher installation levels around the world, the lack of threat to the solar investment tax credit, lower than expected tariff recommendation by U.S. ITC, strong debt financing activity, and over a billion dollars in securitization deals helped the solar industry have a much better year in terms of financial activity compared to 2016. After several challenging years, most of the solar securities were up in 2017 reflecting overall positive sentiments around the solar industry even as several Chinese manufacturers decided to go private. Of course, all this could change swiftly if President Trump decides to impose higher tariffs in the trade case," commented Raj Prabhu, CEO and Co-Founder of Mercom Capital Group. Global VC investments came to $1.6 billion in 99 deals in 2017, up 30 percent from the $1.3 billion raised by 78 deals in 2016 - led by several large private equity deals in India. 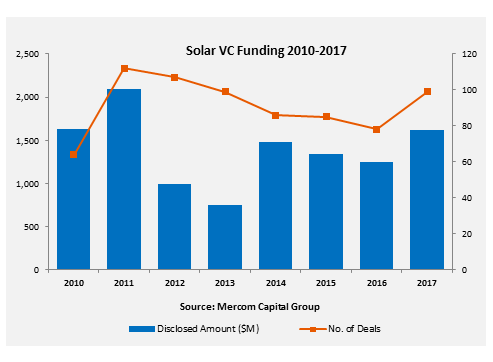 Solar downstream companies accounted for 85 percent of total VC funding in 2017, bringing in $1.4 billion of the total $1.6 billion raised. Thin-film companies brought in $106 million while service providers raised $47 million. Investments in PV technology companies came to $40 million and Balance of Systems (BoS) companies raised $36 million. The concentrated solar power (CSP) category raised $8 million and the concentrator photovoltaics (CPV) category received $6 million. 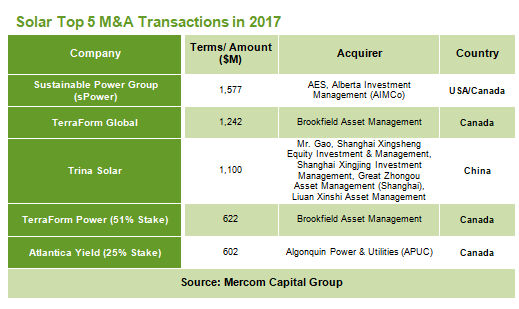 The top VC/PE deals reported in 2017 included a deal for $200 million signed by Lightsource Renewable Energy. ReNew Power also had two deals of $200 million each, followed by Greenko Energy Holdings which raised $155 million. Hero Future Energies raised $125 million and CleanMax Solar raised $100 million. 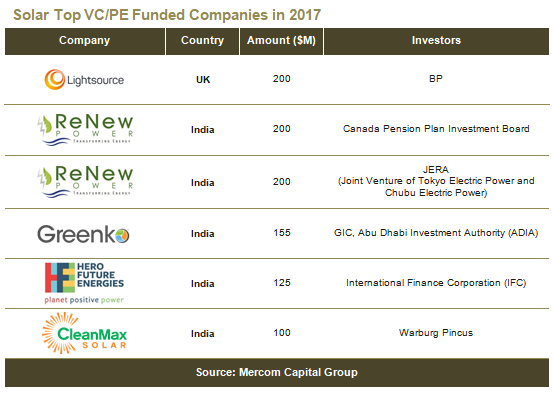 Overall, five of the top six solar VC funding deals in 2017 came from India. There were 162 VC/PE investors that participated in funding rounds in 2017, with eight involved in multiple rounds: Engie, Avista Development, DSM Venturing, InnoEnergy, Innogy, International Finance Corporation (IFC), Shell, and Techstars. Public market financing was flat in 2017 to $1.7 billion raised in 33 deals from $1.8 billion raised in 27 deals in 2016. Three IPOs were logged during the year that raised a combined total of $363 million for Canadian Solar Infrastructure Fund, New Energy Solar Fund, and Clenergy. Announced debt financing in 2017 surged to $9.5 billion compared to $6 billion in 2016. There were six securitization deals in 2017 totaling $1.3 billion. Securitization deals surpassed the $1 billion for the year, a first. $2.4 billion was raised by 16 residential and commercial solar project funds in 2017 which was down 50 percent compared to $4.9 billion raised by 30 funds in 2016. The top fundraisers were: Sunlight Financial, Sunnova, Solar Mosaic, SolarCity, and Spruce Finance. Since 2009, solar residential and commercial firms offering leases, PPAs, and loans have raised more than $24.8 billion in lease and loan funds.